This is a repost of another early Nuclear Green post. It actually predates Nuclear Green, and was in fact written shortly after Weinberg's death. Unlike Ralph Nader who was not a giant of integrity, Weinberg revealed great integrity. Weinberg was fired as Director of ORNL because he stood up to the Washington AEC establishment over nuclear safety. Weinberg had the backing of most of the nuclear scientists at National Laboratories, but the fact that he was fired was kept secrete for years. Weinberg was a brilliant nuclear scientist, and a successful science administrator. My father, Dr. Charles Julian Barton, Sr., died in 2009. At the age of 97 he was one of the last of his generation of scientists in Oak Ridge. He was recruited in 1948 to do research at Oak Ridge, first at the Y-12 plant, but for most of his Oak Ridge career he worked for ORNL. For most of his Oak Ridge career, my father worked under Alvin Weinberg's direction. In particular, he worked on the Aircraft Nuclear Propulsion and the Molten Salt Reactor Projects. The Lab was very hierarchical and Weinberg was the big boss. Oak Ridge is a small place, Alvin Weinberg's son, David Weinberg, attended the same school I did, and we became friends. I visited the Weinberg home on a number of occasions. David was, like me, intelligent and sensitive. It is through my childhood friendship with David that I feel a personal bond with Alvin Weinberg and his work. Science is based on integrity. Without integrity, there is no truth in science. My father was a man of exceptional integrity, and so was Alvin Weinberg. Weinberg was aware of both the promise and the dangers inherent in the reactor. During the 1960's, Weinberg directed a series of tests at ORNL designed to verify theoretical assumptions made about the safety of light water reactors which were being pushed by the AEC for the generation of electrical power. My father was one of the scientists who were conducting this research. The scientists came up with recommendations for further nuclear safety research which they gave to Alvin Weinberg. The results were disturbing to Weinberg and his staff. The standard design of light water reactors was shown to have serious safety flaws. Weinberg began to warn people within the industry about the problem. For Weinberg, superior safety was one of the most important features of the Molten Salt Reactor design. Weinberg regarded the AEC's commitment to electrical power generation through light water reactors as irrational. Not only were they less safe than other designs, but also they could not be used to breed new fissionable materials. The Molten Salt Reactor potentially was an ideal atomic breeder that could produce more fuel than it consumed. A generation after the controversy, Weinberg's brilliance is fully appreciated, but at the time, Weinberg was a thorn in the side of the establishment. Powerful congressman Chet Holifield had it in for Weinberg because he saw Weinberg's reactor safety concerns as threatening the Atomic power industry. Holifield confronted Weinberg and said, "Alvin, if you are concerned about the safety of reactors, then I think it might be time for you to leave nuclear energy." Holifield was powerful enough to have Weinberg fired from his position as Director of ORNL. Weinberg's reactor safety concerns were vindicated in 1979 when coolant loss in the Three Mile Island-2 power reactor lead to a partial core meltdown. Reading the details of the accident would not have comforted Weinberg, even though he had foreseen it. Yet the Three Mile Island accident did not cause the decline of the atomic power industry. Between the year of Weinberg's firing in 1973 and the year of the Three Mile Island accident in 1979, 40 planned nuclear power plants were canceled. 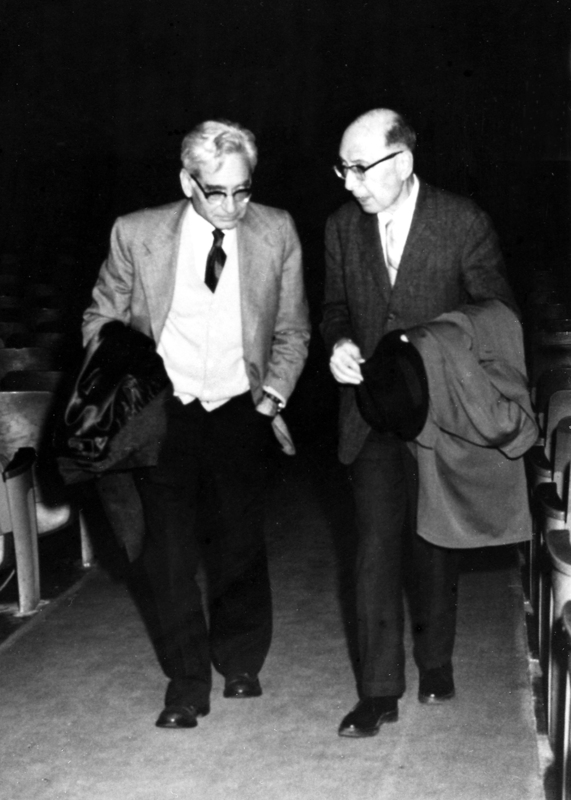 As he believed, the First Nuclear Age ended with Weinberg's firing in 1973. When I worked at the ORNL in 1970 - 1971, the scientists there spoke of Weinberg with great respect. Weinberg was a visionary who believed that cheap sustainable power could improve the lot of the worlds' poor. He envisioned technological complexes surrounding reactors transforming the lives of third world peoples. Weinberg was no mad scientist; he was an heir of the Enlightenment, whose vision was developed in a tradition. That tradition of vision was of a science based transformation of human life. That vision stretched back to Frances Bacon and Rene Descartes. Hopefully Weinberg was not the last of the technological optimists. Should the world demand for energy increase sixfold within the next 50 years, largely because the underdeveloped countries industrialize, and if half this demand is met by coal, then the estimated world recoverable resource of coal of 4 x 10/sup 12/ metric tons would last at this asymptotic level about 140 years. The carbon dioxide concentration in the atmosphere is then estimated to increase about threefold. These two eventualities may place limits on our ultimate use of coal. The risk of a CO/sub 2/ accumulation inherent in the widespread use of coal is in a sense analogous to the risk of nuclear proliferation: both problems are global, uncertain, and could pose profound challenges to man's future. I know of the integrity and care of Weinberg and of the scientist who first accepted Weinberg's warning. Only fools and scoundrels would ignore it. I was a witness. Got a grammar nit for you. Great post. It's especially significant that Weinberg's attention to the issue of anthropogenic climate change comes years before the so-called leftist conspiracy was alleged to be formed, and Weinberg himself was uniquivocally and unabashedly an advocate of clean, abundant energy. I had the interesting opportunity to read A Weinberg's book again over these past weeks' holiday. Fact is, as clever as he was Alan Weinberg lived off govt welfare support for his whole life (that is, he was a tax eater, a technocrat, certainly not his own man but owned by superiors who were responsible for feeding and clothing him so he could do as they bid him to do). He was fanatic on his own specific brand of nuclear power to the point of professional self-destruction (which ultimately is why he could not and did not survive in the role of senior bureaucrat/functionary and why he was not allowed near the levers of serious political power or decision making). Weinberg's denigration of alternatives to and competitors to his favoured brand of technology has to be seen in context. He believed in a specific ideal. Technology outside of that was vigorously opposed. Hence his CO2 utterances- nonsensical rhetoric without serious scientific evidence, nothing whatsoever (some back of envelope calculation hardly counts as evidence). There is no free lunch. Any form of energy is going to come with costs. Those costs are going to be allocated unevenly and unequally across society, as will any benfits. Weinberg suffered from the hubris that he best knew where energy ought to be generated from and how the costs and benefits were going to be allocated. Trouble was he didn't know. He had no way to know what was best and what it was that people would require or want, let alone put up with. His masters knew that he couldn't and didn't know. After all, it was they who fed and funded him. When it came to the crunch he was easily pushed aside as (politically) he was lightweight- easily conveniently replacable. The great tragedy of his life is that he didn't know it but he suffered from the socialist calculation problem. This problem can't be solved, even by the cleverest of sophists or scientists. He wasn't the smartest of men to have suffered from ignorance of it. Unfortunately he will not be the last. What can be posited is that it is likely that molten-salt thorium is superior to conventional nuclear from a technical point of view. It may be safer as well. Time may tell us. Fact is, presently it is not what people want. Fukushima is dumping badness onto the Western USA (not forgetting what it is already doing to Japan and the North Pacific Ocean and the Islands). People are unlikely to like that very much. So they are going to oppose nuclear power of any flavour for some long time to come. Further, the USA is failing. Financially things are getting tougher and the standard of living is falling. It is going to be a big ask to get an alternative new nuclear technology funded and up and running there. Possible, but very, very difficult. Don't hold you breath!